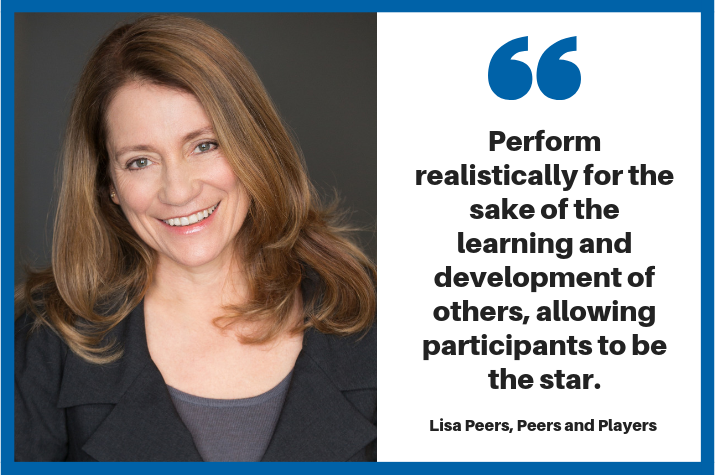 Since 1998 NIDA-trained Lisa Peers has been involved in organising and directing corporate actors for communication training as well as being an expert role-player, facilitator and presentation skills coach. Here are her 10 top tips for succeeding in the lucrative world of corporate role playing. 1.Be the supporting actor. Play the given character and perform realistically for the sake of the learning and development of others, allowing participants to be the star. 2.Improvisation experience. Because there’s briefing notes but no set script, you’ll be basing your reactions on what you get from the participant. It’s important to respond in character. 3.Be succinct. Make everything you say mean something about the state of mind of your character. Prompt the participant to lead the meeting and demonstrate their strengths. 4.Direct and act. You will be leading the scenarios, while helping participants to feel that they are in charge, and guiding them to display and learn the skills they are good at. 5.Multi-task. Play your role; give complex details about the scenario when required, while noting your participant’s feedback. 6.Learn about human behaviour. Be an expert in non-verbal skills. In this context, words are secondary to how vocal and physical awareness can impact others. 7.Give constructive feedback. Explain how participants made you feel during simulated meetings, with specific examples. This can be written or verbal. The Sandwich model is a good place to start. 8.Knowledge of training models. Training in GROW, DISC and/or Personality typing is a plus (training may also be supplied on a job-by-job basis). 9.Dress and behave credibly in a corporate environment. Corporate actors must own appropriate attire for high-level business meetings. Make sure you have a smart outfit ready to go. 10.Get started. Once you have experience with basic medical, police or defence role-play, contact corporate training companies (including Peers and Players) with your corporate headshot and bio ready to impress!